The sure to be awful Seth Rogen movie is more then likely dead! Last edited by Renaud; 06-20-2009, 08:38 PM. Green hornet poll: Old mask versus new mask? Last edited by Renaud; 06-26-2009, 12:10 PM. Last edited by Renaud; 06-26-2009, 12:23 PM. Last edited by Renaud; 06-26-2009, 12:45 PM. And for those that support dumb movie making, to perhaps go back and hide in their closet. Last edited by Renaud; 06-26-2009, 01:04 PM. Last edited by Renaud; 07-01-2009, 07:02 PM. Last edited by Renaud; 07-08-2009, 05:30 PM. 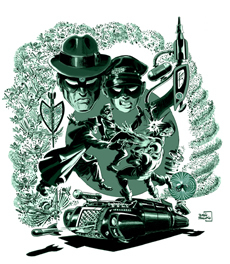 I would love for a writer that I do like (Project Superpowers, Zorro) to do a comic book series GREEN HORNET YEAR ONE with the origin story of the first original classic Green Hornet, full face mask and all. Last edited by Renaud; 07-08-2009, 01:04 PM. It is definitly a female Kato. See the character sketch below. It's not the fisrt Female Kato. Now Comics did it but was told to drop her by the Copyright holder. (how times change ). I think the link is in one of the other Hornet threads but word is that Matt Wagner is doing a Green Hornet Year One. What are the chances of DE reprinting the NOW comics series in trades? Last edited by Renaud; 07-09-2009, 09:33 AM.